• The Artistic Awards cover virtually all aspects of modern laser displays, from the creation of individual laser graphics to the production of huge outdoor shows. • The Technical Awards, named for pioneering laserist Fred Fenning, honor technological achievements that advance the industry. 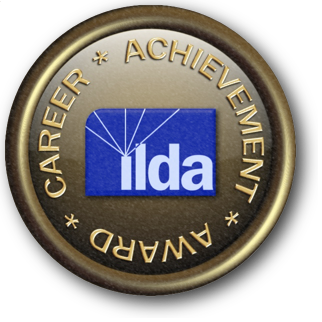 • The Career Achievement Award is ILDA's highest honor, given for work spanning many years in the area of show quality, innovation, and industry service. For more details on the winners, download the 2018 ILDA Awards booklet (PDF format). The booklet lists all winners, plus credits and a description of the work. Videos of the winners (1st, 2nd and 3rd) are available on YouTube. Links are below, in the list of winners. You can also go to the ILDA YouTube playlists for all Award-winning videos or for just the 1st Place winning videos. If you want to get a quick overview of all of the winners, below is a video compilation of the 2018 Award winners. This 28-minute video contains short excerpts from each Award-winning entry. If you can’t play the video: Because of copyright claims on some audio tracks, the video may not play on phones or other devices, or may not be available in your country. If you cannot play the above video, try a version with copyright-claimed audio removed. About six Award winners will have no audio. Video winners can be seen on YouTube. For first place winners, click on the picture to play the YouTube video. For second and third place winners, click on the show name link to play the YouTube video in a new window. 1st: “Prolight Sound 2017", KVANT Ltd.
2nd: "Da Long Tower", Phantom Media Co. Ltd.
1st: “Static Laser Beam Auto-alignment Safety System", KVANT Ltd.
During temporary or permanent outdoor installations of a high power static laser beam, a potential risk occurs if the beam deviates its original direction or the illuminated object sways with time, which may lead to a dangerous situations. We implemented a new solution to avoid such scenario and to make such installation safe. To deal with the sway of the illuminated object (e.g. building, sculpture, target), or with the beam direction deviation that may happen due to mechanical instability or thermal expansion of the laser system or its base or mount, we developed a special self-alignment safety system to keep the beam targeted exactly where it is supposed to. The laser beam aims at the center of some target located at far distance or mounted on the tower. At the same time the position of the beam in relation to the center of the target is monitored with the camera system and the beam position data is sent to the Master Controller (e.g. computer). If the system analyses that the laser beam isn’t hitting the exact center of the target, it sends the new targeting data back to the laser display system. 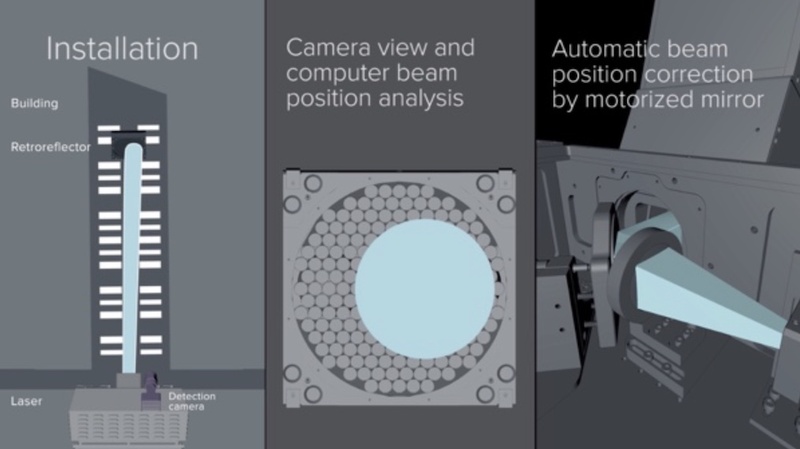 The laser targeting algorithm adjusts the tilt of the motorized beam reflecting mirror so the beam is aimed at the center of its target again. This cycle happens during the start sequence each time and then continuously in real time or in certain time interval while the laser display system is in operation. If the correct alignment of the beam to its target isn’t confirmed by the Master Controller within three safety check cycles, the power to corresponding laser display unit is cut off. The camera system is equipped with a telescope objective to reach necessary spatial resolution. The software recognizes the shape of the target and any target shape can be programmed. In order to reduce background light a narrow bandpass optical filter can be installed in camera if necessary (although this works with 100% reliability for single color beam only). Mercury is an entirely DMX-based integrated laser control system built from the ground up specifically for lighting designers to use not with laser control software, but with a modern lighting console such as GrandMA, Avolites, Chamsys, etc. Featuring DMX+RDM, ArtNet, and in the future Streaming ACN (E1.31/E1.33), Mercury can be used from the lighting console just like any top-brand moving light. It can be discovered, profiled, configured, and programmed directly from the lighting console. The IDN-Toolbox is software that can be used to receive IDN streams on a laptop or desktop computer. The IDN stream(s) can either come directly from software being able to generate IDN streams (like Medialas, HE Laserscan, LSX, ... - as already being demonstrated by Uni Bonn at recent ILDA meetings), or an IDN stream may be generated using an ISP-DB25 to IDN converter (like the StageFeed ISP from DexLogic). In the latter case the IDN-Toolbox can be used together with any laser show system, attaching the converter to IDN to the ISP- DB25 output of the system (e.g. connecting to LaserGraph DSP, to JMLaser Netlase, to Pangolin FB3/FB4, or any other laser DAC with ISP-DB25 output). 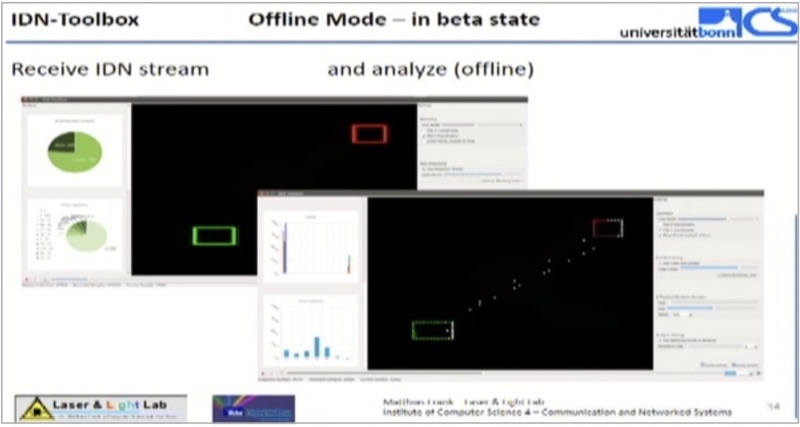 The IDN-Toolbox can visualize the laser stream/frame data on a computer monitor (similar to the laser preview that many laser show systems provide). However, when the IDN-Toolbox receives data according to the IDN continuous mode (aka “wave mode”), either directly generated from software or coming from an ISP-DB25 to IDN converter, the scan speed and scanning effects (flickering, low scan speed) can be visualized with the IDN-Toolbox as well. If the graphic driver/card of the computer is sufficient, the visualization works with 60 fps (frames per second). Furthermore, the IDN-Toolbox is able to analyze the received laser stream/frame data. Blanking points/lines will be made visible. Statistical data like point durations/point repetitions will be available (i.e. to identify possible “hot spots”). Histograms can be used to display the analyzed data, e.g. histograms of color values, histogram of distances between consecutive laser points, and others. The initial concept of the IDN-Toolbox was presented and a very early prototype was demonstrated at the Advanced Technology Workshop at the ILDA meeting 2016 in Baltimore. At the ILDA meeting 2017 in Bratislava (ATW and IDN seminar), the stable version of the IDN- Toolbox was demonstrated and a use case of integrating the IDN driver into the Dynamics software with help of the IDN-Toolbox has been reported on. A piece of software that is able to switch, map and multiplex between different IDN-based senders and several IDN-based receivers in a local network. The basic idea and motivation for an IDN-Switcher is based on the digital transmission of laser data over a local network. With IDN (the ILDA Digital Network) an open specification of data formats for laser projector control became available. 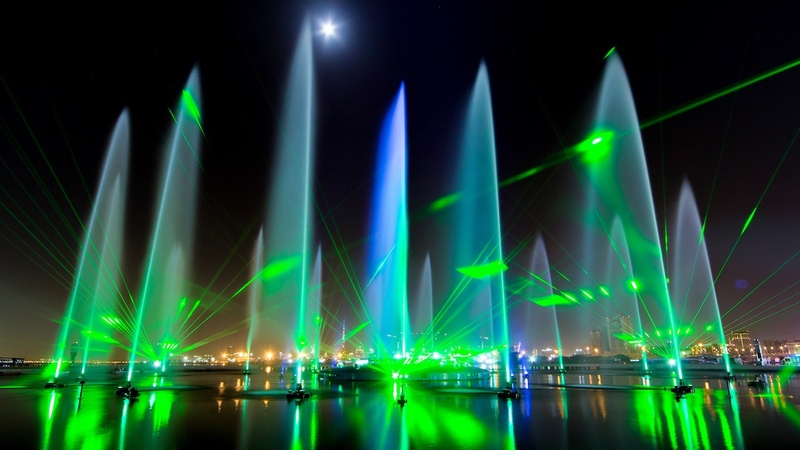 IDN aims to provide an open standard/specification to allow for a unified way to connect laser show software with laser projecting devices. (IDN stream specification became an ILDA technical standard in October 2015). Any IDN-enabled software may directly send laser data to IDN-enabled laser projectors or IDN-enabled receivers. An IDN-enabled switcher can be installed in the network (on a dedicated computer like a laptop, an embedded device, or similar) to control the flow of laser data between senders and receivers, allowing to switch on/off individual sources, map sources to projectors and even map single streams to several projectors or combine several streams onto a single projector. supports both the IDN continuous mode (wave mode) and IDN discrete mode (frame mode). works with the Dexlogic ISP StageFeed, which can be used to connect to legacy (non IDN-capable) devices via ISP DB 25 and feed IDN wave mode streams with 100 kHz sampling into the IDN local network. is able to map single IDN wave mode streams to one or more IDN receivers. is able to map several, independent IDN frame mode sources to one of the IDN receivers (using the IDN channel principle). Several laser frames will be projected one after the other in an interleaved way by the IDN receiver. The IDN-Switcher can be understood as a device (hardware + software combination) that helps to control the access from a variety of laser show software sources to a number of available receivers (laser projectors). 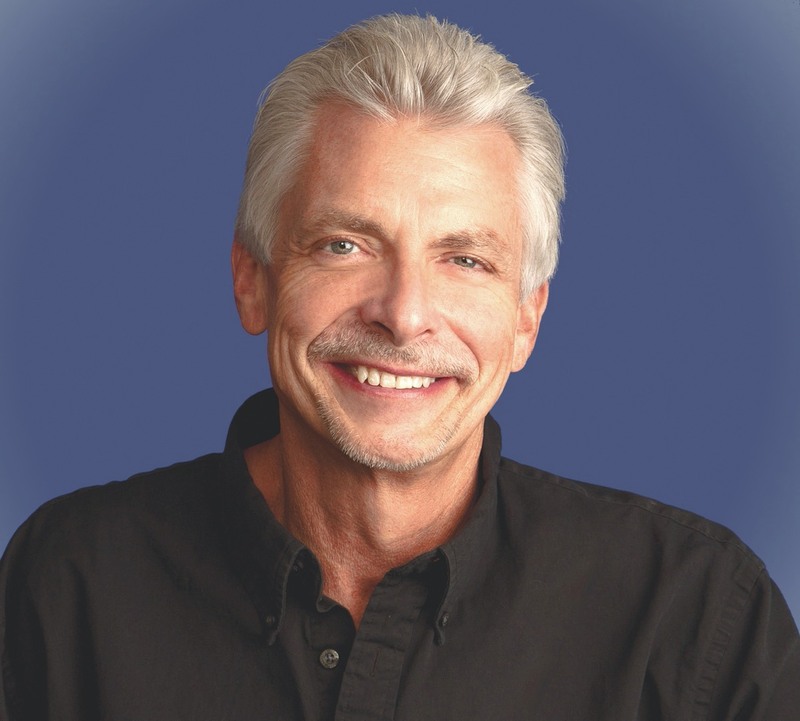 ILDA has published online Glenn Thomas' book "Laserium® Laserist: The Greatest Job on Earth". Below is the speech given by Glenn Thomas at the ILDA Awards Banquet and Presentation, November 12, 2018 in Montréal. I felt OLD before I came here. After spending two days with you, I feel absolutely ANCIENT. Yesterday, one of you said “You’re not old. You’re HISTORIC. That was hilarious! Tim Walsh, It was great to meet you in person. I heard that you are also HISTORIC! Yesterday, I also saw and learned many things. First, I saw the greatest laser projectors in the world made by Michael Sollinger. Their white light, range of colors, and perfect uniformity was absolutely amazing. Michael, your projectors are spectacular! Second, I learned that beam performances could be just as subtle and artistic as scanning performances. I think some of you probably saw me, on my knee, bowing to Markus [Voggenberger, of VisuTek e.U.]. Amazing artistry, Markus. Third, Chris Short continued to impress me with his pursuit of scanned abstract imagery. To see the live performance console that he developed with Andrew Kilpatrick was exciting as well as baffling. What I am baffled about is that, in 2018, you are still trying to build a laser light synthesizer that you can play live shows on, like the one Laserium® built 42 years ago! I think that we have lost an art form that used to exist with Laserium. It has always been my dream that some day, someone will build a live performance laser light synthesizer that not only equals Laserium’s but takes laser art to the highest level possible. Tonight, I also want to say “God Bless Ivan Dryer” as he watches this convention from Heaven. Thank you for inviting me to this convention, for your hospitality, and for recognizing my time at Laserium with this incredible award. It was a great HONOR to be nominated along-side such fantastic people as Alberto Kellner and Paul McCloskey. Gentlemen... I don’t know you personally, but I wish you the very best of everything and I’m sure that you both deserve this award more than I do. About six months ago, I was TOTALLY STUNNED to get an email saying that I had been nominated for an ILDA Award by none other than Doug McCullough, my arch nemesis from the 1970s. First, his company, AVI, booted me and Laserium out of our awesome gig at the Hayden Planetarium in New York City. Second, that booting got me sent to the Griffith Observatory in L.A. where I spent the next 26 happy years performing live Laserium shows for stoned crowds that absolutely loved it. Third, out of the blue — and I have no idea what he was thinking — Doug submitted a beautifully-written ILDA award nomination for me. because of Patrick Murphy, who found and shared my six-minute documentary film and my small story about the greatest job on earth. Thank you Patrick! Last, but not least, I know that I’m here today because of all of you who were kind enough to vote for an ancient, old,... I mean HISTORIC laserist from the 1970s. To be included in your very distinguished list of previous winners is the greatest honor of my life. My family and I will be forever thankful to you all. Lase-on and may the force be with you! In 2017, ILDA received 181 artistic and technical entries from 37 different Member companies. • Most of the artistic entries were judged 3-4 June 2017 in Germany by a three-member panel that met for two days of review and voting. In addition, there was an earlier, separate round of judging which was a test that did not affect the results. • Laser Photography and Career Achievement Award entries were judged by ILDA Members voting online, 29 May - 12 June 2017. • Fenning technical entries were judged via online discussion of a three-member panel that reached its decision 25 July 2017. • Laser Jockey entries were viewed and judged by attendees at the Lase-Off during the ILDA Conference in Bratislava on 7 November 2017. The 2017 Artistic judges rated each entry according to four factors: technical competency, artistic competency, quality and variety of effects, and music sync. These were used by the judges in making their final choice of winners. Members who entered the 2017 Awards were emailed their row numbers and entry names. They can match this with the row numbers in the anonymous Judges Rating Spreadsheet, so the Member will know how his or her entries did, relative to others in the same category. • The Test Results Round 1-2 Judging Spreadsheet shows the results of a trial to see if judging could be sped up. The idea was to use the previous year’s judges to briefly preview all entries. Each of the three first round judges decided whether they thought an entry was good enough to be in the top five or so entries in a category, or whether an entry was so poor it would not make it in the top five. This was a Yes/No decision for each first round judge. Then, only entries with all three first round judges agreeing “Yes” would be sent to this year’s main judges, for their detailed discussion and placement. For 2017, this was intended to be a test. However, the first round judges were not told of this in advance. It was felt that if they knew it was a test they might not take their task as seriously. The first round judges thought this was the new system being used in 2017. But instead, all entries were sent to the second round (main) judges just like in previous years. This way, we could see whether the two sets of judges agreed on which shows scored poorly. As the spreadsheet data indicates, the test was not a success. There were two cases where all three first round judges voted that an entry should not go to the second round — yet that entry was voted in the top five by the second round (main) judges. One of these even won a Third Place ILDA Award. The spreadsheet’s second-to-last column also shows 16 cases where two out of the three first round judges voted that an entry should not go to the second round — yet that entry was voted in the top five by the second round main judges. Six of these even won a First, Second or Third Place ILDA Award. ILDA requires its Members to perform safe and legal laser shows, and to acknowledge basic principles of laser show safety. Beginning with the 2014 Awards, all entrants submitting videos have explicitly certified that their laser effects depicted met safety standards, as well as all applicable laser safety laws and regulations (including laws for audience scanning) in the location where the show was performed. • Entries filmed in a studio, with no audience, can use any power and can scan anywhere, even if the original show was intended for an audience. 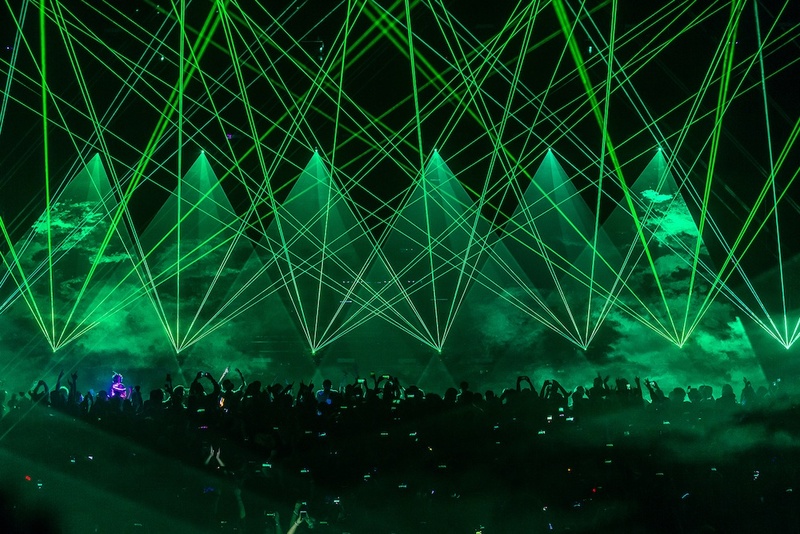 • However, if the video depicts an audience watching the laser show, or has lasers near performers, then the show must be safe for the audience and performers, and must comply with all applicable laws and regulations. Documentation must be provided to ILDA about the show’s irradiance at the point of closest audience access, and any other safety measures that were implemented. • The above documentation is also required if an entry depicts beams in an area where an audience might be, such as an empty tradeshow floor or an empty auditorium. This is because a video of unsafe beams in an audience area gives an impression that the same show would be run with an audience present. Since 2014, ILDA has reviewed every entry for any potential safety issues. ILDA has the right to remove or disqualify an entry if, in our sole opinion, 1) the show violates or appears to violate safety standards, laws and/or regulations, and/or 2) the show does not have sufficient documentation of safety and legal compliance. Note that despite ILDA’s review process, ILDA cannot absolutely certify that an Awards entry is safe and legal. This is ultimately the responsibility of the entrant. IMPORTANT: If you have a laser or a laser projector, do NOT attempt to perform the type of audience-scanning effects seen in ILDA Award-winning videos 1) without qualified expert safety planning and supervision and 2) without prior written permission from appropriate authorities. These authorities may include federal, state and local laser safety regulators, venue operators, and insurance companies.